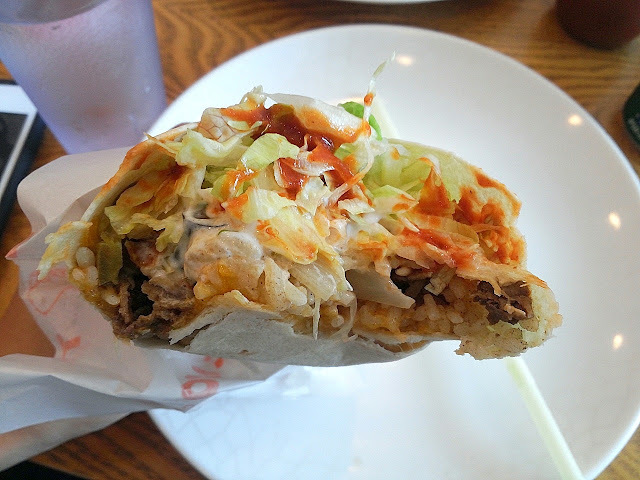 This'll be a short little post on a Mexican joint in my area on the main street by Noksapyeong station. I've passed by Taco Chili Chili often but only recently tried it for the first time. They have common Mexican joint foods like tacos, burritos and even things like enchiladas on the menu. 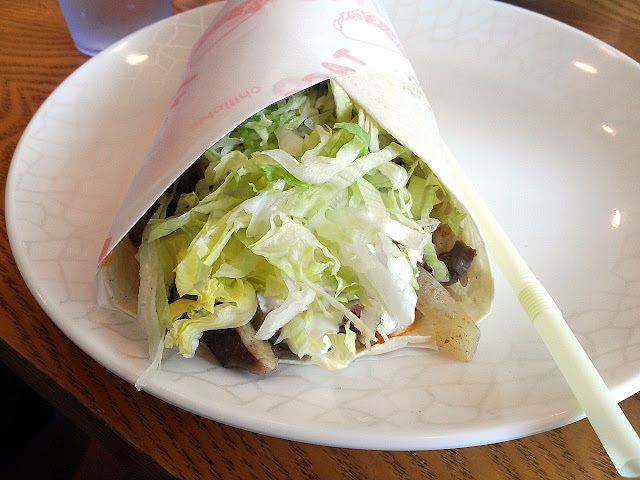 There's even a vertical meat spit for tacos al pastor which is uncommon to see in Korea. My friend and I tried out the regular beef burrito and regular beef fajita. Unlike a make-your-own fajita like we're used to, the fajita comes already wrapped and made. On first glance, I commented to my friend I wished I had ordered the burrito like him since mine looked like mostly a pile of shredded iceberg lettuce. 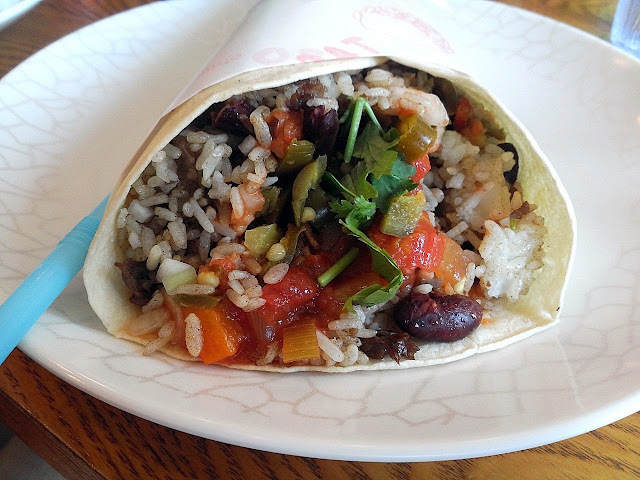 My friend's burrito was much more visually appealing with beans, salsa, rice, chiles and even sprigs of real cilantro. While the beef burrito had won on aesthetic appeal, it was more appearances than taste as it was comprised mostly of 60% rice, 10% beans, 25% salsa and maybe 5% beef (if even that). 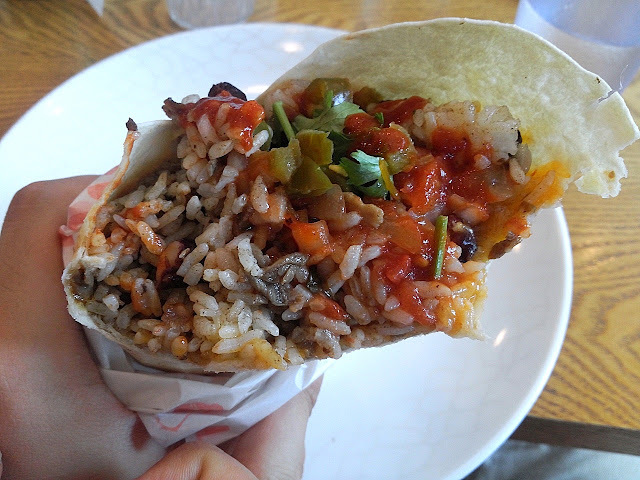 It was basically a tortilla stuffed with beans, rice and salsa which was something anyone could have easily recreated at home for a fraction of the 7,000 won price. Taste-wise too I found it rather bland too after sampling and my friend liberally doused it with the hot sauce provided. There are, on a side note, four level of spice for their sauce you can supposedly get including a habanero one. The beef fajita was slightly better with beef you could actually taste (and see). The sour cream was a nice touch (a little guac would have been nice but I'm getting selfish in Korea then...) but there was way too much shredded lettuce and way too little of any sauteed veggies to really call it a fajita. In short, Taco Chili Chili doesn't stand out in anything from price to taste to value. And given the plethora of, what I assume based on what I've heard, are better Mex options available in the Itaewon area (Don Charly, Vatos, etc), I say pass.